Magically summon clean air with FitAir’s® Genie! For those small spaces where smells can become concentrated we’ve magically summoned Genie! This space-saving unit is compact and great for deodorising and freshening storage boxes, cabinets, cupboards, wardrobes and drawers. An excellent alternative to carcinogenic mothballs, Genie is able to kill bacteria and deter the growth of mildew, making it perfect for smelly shoe cupboards and gym bags! This slim, battery operated unit is perfect for popping in your suit carrier or luggage holdall to keep clothes smelling fresh wherever you go; it even helps neutralise harmful chemicals left on your clothes after dry cleaning! What’s more, the unit is supplied with a Velcro sticker and detachable hanger, meaning you can place Genie wherever you like – apply to walls and shelves, or hang from rails - then remove easily for storage or travel. A built-in micro CPU intelligently controls Genie’s operation cycle so you don’t have to worry about checking up on it; the blue LED ring will let you know when the unit is working! Genie cleans your air continuously for 30 minutes; after this it goes into an automatic energy-saving cycle of 2 minute sterilisation and deodorisation every hour. Like all FitAir® products, Genie cleans the air around it by using negative ionisation technology. A small grill at the top of the unit releases these ions which are attracted to and latch onto bacteria, viruses and other odour-causing pollutants found in the air. These tiny particles are then neutralised through a process known as cell-lysing, where the wall of the airborne structure is ruptured and destroyed - it’s a bit like deflating a balloon! The remaining neutralised particles cluster together due to their electric charge and as they become heavier they eventually drop out of the air and settle as dust. Genie is a great alternative to chemical fragrances and toxic mothballs; not only is it a safe and energy-efficient way to control odours – it has the added bonus of neutralising viruses, bacteria and harmful chemicals. If you find strong odours like smoke and food tend to make your clothes smell, even when they’re in a cupboard or drawer, Genie is able to deodorise and sterilise the source of the problem before it comes in contact with your favourite outfit. If you prefer to use organic and chemical-free washing detergents, you may find your clothes absorb smells more quickly. Don’t feel like you have to buy strong laundry products with potentially harmful ingredients, just to keep them smelling fresh; with Genie all your naturally fresh wishes can come true! 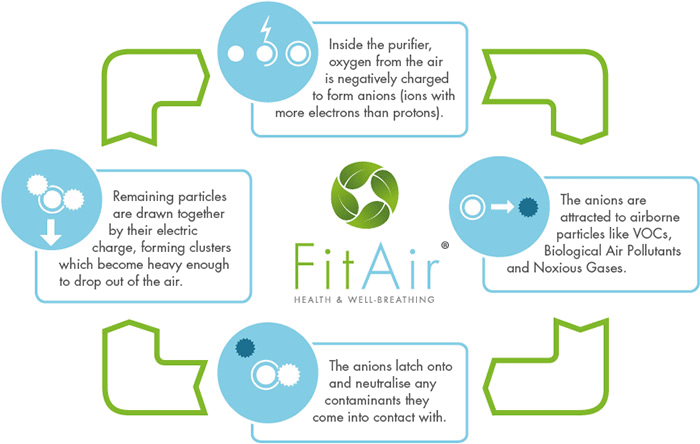 If you are looking for an air purifier for a child’s bedroom, look no further than the FitAir® range. Our air purifiers kill up to 99.9% of germs and bacteria in the air. This is perfect for the whole family, but especially useful if you have young children. Younger children cannot blow their own noses, and their understanding of hygiene is non-existent. You therefore have to do all you can to stave off illnesses caused by germs and bacteria, many of which float around in the air; preparing to attack your little ones limited defences and make their lives miserable! A baby’s nursery air purifier can help give your little darlings the very best chance of avoiding the many hundreds of common cold and flu viruses that circulate in the air. The FitAir® range offers outstanding protection for everyone from new-born babies to older adults. Air quality and children’s health directly reflect one another, this is why you will often see air purifiers in children’s nurseries; why should the home be any different? We have done our research to create the best air purifiers for baby’s bedrooms and the whole home, protecting you and the ones you love and giving you the FitAir® you deserve.